I've had occasion over the past couple of days to spend several hours in Las Vegas' snazzy new Regional Justice Center (which, by the way, has the same ridiculous "security theater" procedures as the airport). And don't worry -- I was neither a defendant nor a plaintiff, and no one involved in my particular legal proceeding is going to jail. In any case, as I wandered those sunlit halls of justice, I saw this little sign taped to the door of one of the courtrooms. I see it as yet more proof that, even in our most sacred institutions, nothing is for free. I don't mean to be flippant, and I know that fees are necessary in order for agencies to operate. But the wording of this sign leaves much to be desired. Indeed, it just sounds totally corrupt. Yeah, and I'll be back tomorrow to do it all over again! Woohoo! A satisfied customer (whose name is visible on her cup) sent me this pic from this year's Fiesta Filipino at the Boulevard Mall. With the Grouchy Johns logo in the background, I think this is what they call a "well-composed" shot. The "Suicide" smoothie, by the way, is a smoothie made from combining strawberry, mango &amp; peach flavors. Our customers came up with it, and, due to popular demand, the "Suicide" made it onto our regular menu. Join Us at the El Cortez NOW! We are supposed to be feeding a conference of hackers at the El Cortez, but no one has shown up yet. Maybe the conference got hacked! Well, at least we're here with 2 great trucks, Snow Ono Shave Ice & Lulu's On The Move, both of whom serve amazing stuff. And, on top of that, they're all really wonderful people, too. In any case, we will be here until 1pm, so come on down! Doing Anything This Friday Night? For those of you who can't make it to the first night of EDC, come on down to Slidin Thru HQ and party with all of us at the Parking Lot Pimpin Block Party! There will be all kinds of great food being served, and Paradise Poker Club & Sailor Jerry Rum will be offering drink specials for those of you who are "of age." There will even be a mobile video games truck! While I keep a journal, it's largely a haphazard thing, a vast assemblage of notes, rambling diary entries, weird little narratives, and textual snapshots that illustrate odd moments. I dip into it occasionally, especially at those strange times (invariably late at night) when I'm trying to remember who I've been. It's like looking into a mirror that reflects only the past. This isn't just narcissism. You should try it. Think back to who you were, say, 15 years ago. Remember your circumstances (where you lived & worked, how you enjoyed yourself) at that time, and try to reassemble that distant self. In what social circle did you travel? What were your thoughts & feelings? What impulses drove you? I doubt they're the same as what drives you now. And knowing how you've changed over the years is critical. After all, you can spend your career accumulating material wealth and public accolades, but those things are ephemeral. What truly matters in a given life are the capacity for love and the ability to achieve wisdom. And neither love nor wisdom can reach their greatest potential without self-knowledge. This is basic philosophy. I know I'm not breaking any new ground here. "For me, writing is a form of prayer, a form of spiritual exercise that rewards effort with restoration. It's a way of centering myself, ordering the chaos that is my quotidian existence, allowing me the serene illusion that I am actually accomplishing something real." It's a paragraph that has essentially repeated itself on an annual basis since I was a teenager, meaning this thought has bubbled up to my forebrain time and time again (which goes to show you how repetitively obsessive I can get). I don't know who I stole it from, but it rings deeply true for me. And, well, I guess in terms of my commitment to writing, nothing much has changed since about the third grade. But a better way to learn about yourself is to find out how others see you. I'm not looking for flattery. 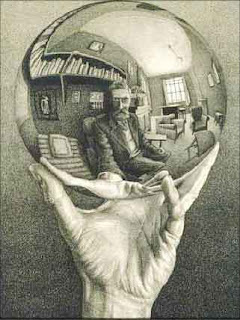 In fact, the more unflattering the perception or memory or anecdote, the more likely I am to find it useful! I'm looking for honesty. And remembrance. Think of it as your good deed for the day. But write. I look forward to hearing from you, if only to find out how many different versions of me are floating around out there in the world. And who knows? Maybe your response will find its way into my memoirs, should I ever get around to publishing them. The novelist Milan Kundera once argued that the moral basis of the novel lies in its ability to explore the immoral. In other words, long-form fiction allows us the imaginative space to examine the consequences of evil without actually hurting anyone. The same could be argued about movies. In particularly violent movies, we (both movie-makers and audience) get to play games of "What If?" without engaging in actual atrocities. Beyond the basic argument behind free speech, this is how we can justify a movie like the Korean gorefest, I Saw The Devil. It's a movie that allows us to wallow in the mind-set of a monster without ever attacking anyone. The plot of I Saw The Devil is a neat twist on the basic revenge drama we're all familiar with. When his fiancée falls prey to a serial killer, a government agent takes time off from work to track the killer down. But the twist comes once the agent finds the killer. Instead of exacting some eye-for-an-eye justice, the grief-stricken agent begins an elaborate game of cat-and-mouse with the killer, alternately capturing him and then letting him go. I Saw The Devil skirts the outer edges of realism, positing a world that is practically overrun with murderers who careen through the countryside with impunity, their greatest dangers being each other. (Well, I guess I could argue that this makes the movie all-too-realistic.) And this movie won't win any feminist champions. The women in I Saw The Devil only come in two flavors: helpless victims and half-baked accomplices. 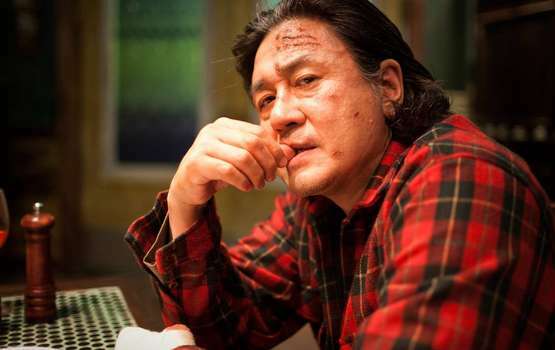 Still, the performance of Min-Sik Choi (of Oldboy fame) is worth the price of admission. He plays his serial killer with a kind of coiled, frustrated impatience, as if the reason he's murdering people is that they had it coming all along. Such physical menace, coupled with his hangdog looks, makes Min-Sik Choi the perfect Everyman murderer, and it's no accident that the movie's conceit has all the moralistic dialog coming out of the bad guy's mouth. On his shoulders lie the movie's philosophical weight, as it were. His dramatic rival, played by pretty boy Byung-Hun Lee, has less to work with, essentially becoming a mix of James Bond and Charles Bronson in his vengeful fury. Yet, as befits our current incarnations of the revenge drama, the final scene belongs to the good guy, even as his face betrays the cost (in both emotions & bodies) of revenge. 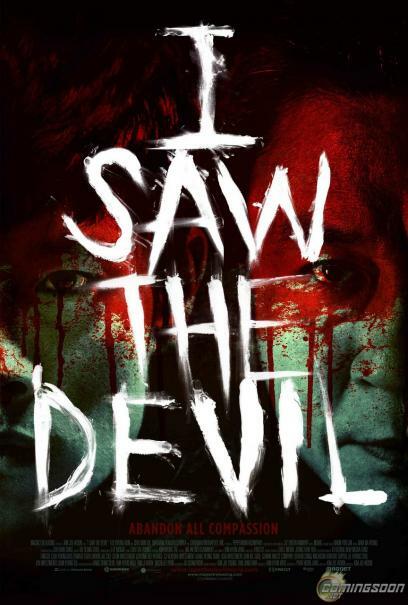 Given its high body count and relentless gore, I would recommend I Saw The Devil only to those who have the stomach for it. Personally, I enjoyed it. Draw whatever conclusions you want from this. ...boils down to this: "Get over yourself." I meet so many people who just can't. They can't develop enough perspective to see beyond their own needs, impulses and feelings. Although my novel, Bloodsucking Vegas: a vampire noir, is available from both the Amazon and Barnes & Noble websites as both a paperback or an e-book, you can also purchase the e-book versions of the book directly from me. Here's how it works: use the drop-down menu below to specify which format of the e-book you want and then complete the transaction via Paypal. Once the transaction clears, I will send you the e-book via email. It's that easy. And buying directly from me offers additional benefits: when you use Paypal to send me 99 cents, I can send you the e-book version of Bloodsucking Vegas: a vampire noir in any or all of the following formats: PDF, Word Doc, EPUB or Mobi. All you have to do is specify which format you'd like using the drop-down menu below. If you choose "Other", I'll just email copies of the novel to you in all of these formats, flooding your inbox with multiple versions of my novel. 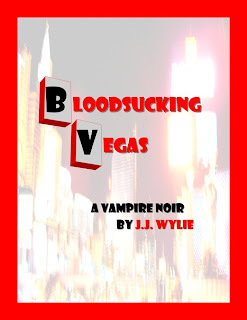 Also, if you specify in the comments section of the order form, I'll even email copies of the Bloodsucking Vegas: a vampire noir e-book to another email address as a gift. Essentially, this allows you to get several copies of the e-book version of my novel for a single 99-cent price. Maybe I need to have my head examined, but it's true. Think of it as yet another benefit of going directly to the source. So, let's cut out the middle-man. Buy this e-book directly from the author. So we come down for this 3 Lions Tattoo grand opening party, and they line us up out back like it's some kind of underground happening that has to hide from roving eyes on the street. The good news is that it's got all the elements of a great party: great food (Slider Truck, TastyBunz, Grouchy Johns & Haulin' Balls), a DJ, and a well-stocked bar. The bad news is you're not here yet! "I'm really sorry. It normally works pretty well." "It's okay. I'm in no rush." "But you were so impressed when I whipped it out. I'm sorry to disappoint you." "Oh, you're not. I'm actually enjoying this. 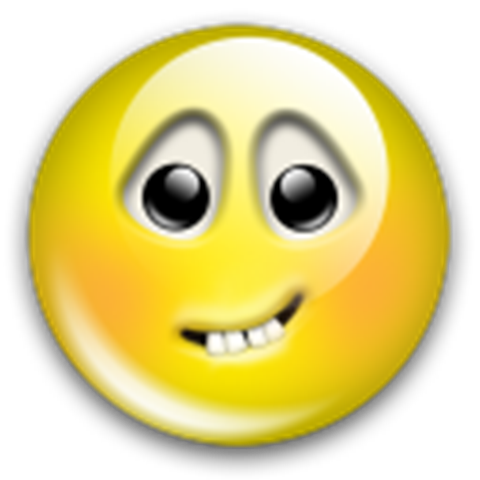 I want to see you make this work." "Or watch me flail helplessly." "Oh, no, I have confidence in you." "I appreciate that. I promise, this was working just fine earlier." "So you've been using it a lot, have you? Maybe it's worn out." "Oh, no, that's not it! I mean, I've used it, but not too much. Just enough to know it works." "Well, it looks cool. I actually am impressed. I'm sure the problem is me." "Oh, no, you're fine. Really. My thingy here is just acting up." "Um, well, we could do something else, I guess." "Oh, no, just give me a second. I'll get it working again." "I promise it'll work. And I really appreciate your patience with this." "Yeah, let me just fiddle with it...Oh yeah, see, it's working now." "Wow. When it works, it's really something." "Yeah, it's great. It makes everybody happy." "Um, are you done now?" "So, could I have my card back now?" "Of course. Did you want a receipt for that charge?" "No, thanks. I'm just glad you take credit cards now." "Okay, then. Here you go. And I'll have your drink up in just a minute." Today We Brought Some Shade! Since today's high is projected at 107, Grouchy John & I thought we'd bring a little shelter for our dear customers, so they don't sizzle while they're waiting for their frappes & smoothies. Personally, I love the summer heat, but even a desert reptile like me needs some shade! So if you visit us today (outside the offices of SK+G at 8912 Spanish Ridge), just know you'll have some cover to duck under while waiting for us to serve you some caffeinated happiness. Oh, and don't forget that our current special is the "Caribbean Colada Smoothie" -- which is made from piña colada flavoring & chunks of real pineapple. Unfortunately, we're not allowed to serve it with rum. Still, it's a great refreshment in this heat. This Is Where I'm Spending Lunch! Grouchy Johns Coffee and our brothers-in-street-food TastyBunz have teamed up for lunch at SK+G (8912 Spanish Ridge, Las Vegas, NV, 89148) until 1:30pm or so. Come on down for some great food and a frappe or smoothie! There's nothing like a few shots of Mizbasho Sake with a visiting family member to get me talking & telling stories that I probably shouldn't be telling. Luckily, the Princess was there to keep me from completely embarrassing myself! Still, you get what you give in this life, and for every story I told, I got to hear one I hadn't heard before. And what is any of us but the collection of stories we've told and heard? Oh, and the consequences of what we've done to collect them? So, the sake may have lubricated my tongue, but the fellowship enriched my soul. Thanks, Brother Jack, for a great evening. This pic, taken by the Princess with some app on her Iphone that makes it look like she was using an old Kodak Instamatic, shows me holding an amazing creation by Snow Ono Shave Ice. It's called the "Spicy Mamacita" -- and it's a flavorful mix of contrasts (ice & heat, sweet & sour) that makes for an uber-refreshing treat on a warm day. It starts with mango & tamarind flavored ices, which are then topped with sourspray & chile con limon spice. I'm holding a kid's size because, well, that's just how I roll. Track down the Snow Ono Shave Ice truck and get yourself one of these concoctions! Besides the "Spicy Mamacita," you can choose from a bewildering selection of flavors that includes old standbys like cherry & grape & cola, as well as unusual options like wedding cake & green tea. Oh, and don't forget to add the li hing mui powder or the mochi bits! I'm not a DJ, but I know a few well enough that I got to play second banana to one on his inaugural podcast! Chris Cox is producer, remixer, musician & DJ who has over 500 remix & production credits, including work for such artists as Michael Jackson, Madonna, Britney Spears & Christina Aguilera. He's even been nominated for a Grammy! In addition, he has DJ'd on several continents, working parties, events & festivals like Coachella and Lollapalooza in such diverse venues as Prague, Sao Paolo, and Beijing. Now, Chris has unveiled his new podcast, using yours truly as his sidekick for a show that mixes dance music and talk for some personalized insight into the world of DJ's, dance music, nightlife, and world travel. Check it out at http://t.co/6e2WAkv and let us know what you think! Look! Even Google Shops At Costco! This is one of those Google Street View cars that we've all heard about, though this is the first one I've actually seen in person. "Um, could I have the Almond Roca Mocha?" "Sure. What size would you like?" "The large. How many pumps of syrup is in that?" "Four. Two each of Almond Roca and Mocha." "Um, can I get an extra shot of each flavor?" "Absolutely. So you want a 6-pump large Almond Roca Mocha. Want whipped cream on that?" "Ooh, yeah. Extra whipped cream!" "Of course. Can I get you anything else?" "Um, can you make that with nonfat milk?" TastyBunz & Grouchy Johns at University Medical Center on June 7th, 2011. Why Haven't You Read Bloodsucking Vegas? Seriously, you should give it a chance. Even readers who don't like vampire novels have liked it. Now, the paperback is $8.99 from both the Amazon and Barnes & Noble websites. Sorry, but I couldn't make paperback version any cheaper. I would if I could, believe me. There are many books in the world, but this one is mine. My book is my creation, the product of my imagination. I had to master my imagination to make my book. My book, without readers, is useless. Without the ability to write, I would be useless. So my book must have readers. And I must write in ways that entertain & interest my readers, or they will not read my book. I have. And I will. My book is unique, because I am unique. But that does not matter. What matters is my book is also fun, because I have made it so. And that is how I live my life -- to have fun and be the best writer I can be. I work hard at the craft of writing, and I pay attention to the effect that my writing has on others. Thus, my life and my writing are one. Now that I have written my book, I need you to read it. I need you to read it and tell me what you think of it. Many have told me that they enjoyed my book. Even so, I continue to champion it. I will do so until everyone has read it. I will do so until everyone tells me what they think of my book. I do this because I am proud of my book. I also do this so that I can make the next book even better. This is my book. This is my creed. This is the order of Kalbi Ribs I just ate at Aloha Kitchen. So tasty!